We’ve had our 2006 Pontiac Vibe for about two and a half years now and we recently passed 80,000km (just shy of 50,000 miles). Overall the car has been working well for us. We’ve had no mechanical issues with the car and the only real cost has been regular oil changes. I think we’re soon due for a brake job though. We still have the original all-seasons on the car after 80,000km but we’ve put winter tires on for two of the three winters the car has gone through. Even with winters, the all-seasons tires still have around 55,000km. With some driving style modifications, I think this car should be able to do consistently in the 6.8L/100km to 7.0L/100km range in the summer. It’s very noticeable though when you turn on the AC as the little 1.8L engine has to rev higher to deal with the added load. This definitely contributes to worse fuel economy. One thing to keep in mind is that the defrost settings on this car also turn on the AC. One other gripe about the car is that there is a very thin layer of paint. It seems that everything causes a small paint chip. I think if you sneezed while standing within 10 feet of the car it would get a paint chip. To try and keep the rust at bay, I bought one of those colour matched paint pens from the dealership and every couple months I have to dab a few more chips. Nothing major but it’s one maintenance annoyance I could do without. We’re probably going to keep this car for many more years. It will probably get relegated to the “second car” in a few years as it’s not quite big enough for a growing family. 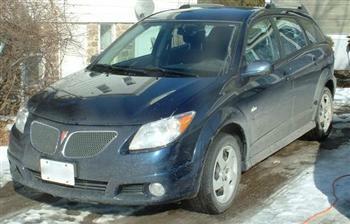 This entry was posted in Automotive, Review and tagged fuel consumption, fuel economy, gas mileage, Pontiac Vibe, real world, Review on 2008/07/29 by Jeff Ivany.